There are no words for the beauty and relaxation you'll feel when you step into The Pandora! 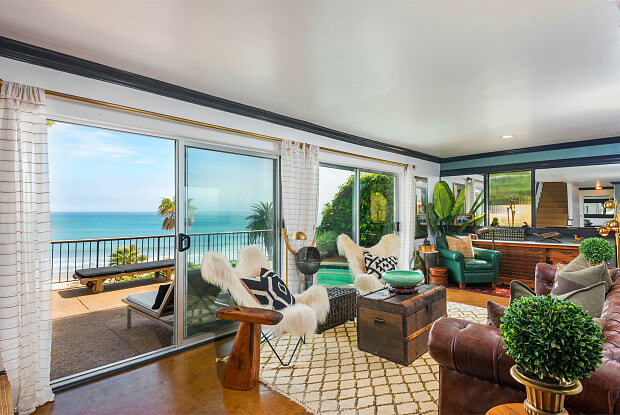 Gaze out into an infinite expanse of sky and ocean from 40 feet above the sea – the property is perched on a garden hillside with unobstructed views of the Pacific Ocean, Leadbetter Beach and Channel Islands. This 2 bedroom/2.5 bath premium suite is one of a kind! In addition to its sweeping views, you will enjoy the huge spa right out your bedroom and living area, a stunning fireplace in the master bedroom, a huge private patio, bbq, cooking station and fire pit, a separate, private balcony on the second floor, and a newly-renovated kitchen sure to please any chef! This is also one of the few suites that comes complete with a washer & dryer for your convenience. Pandora's rustic, nautical theme was inspired by a salvaged sail boat named The Pandora. Several of the aged brass elements such as lights, port holes, cleats, and the compass originated from this vessel. Other high-end design and decor include Restoration Hardware and vintage pieces meticulously picked for this space by the owner. 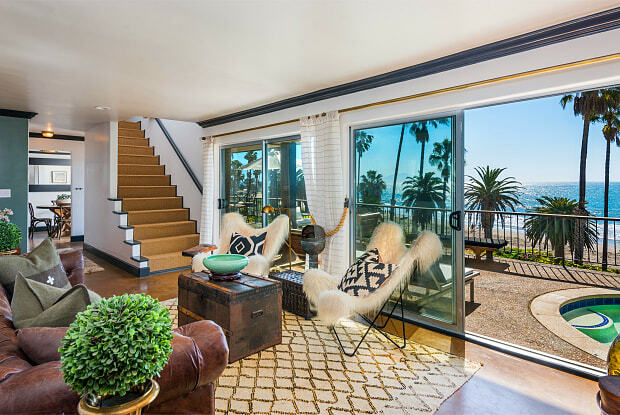 Start your day with yoga or a beach bike ride overlooking the sea, walk to the marina, grab a bite to eat and kayak or paddleboard around the picturesque shores of Santa Barbara, lounge in your private cabana, explore the private stairway to the beach and then relax by the fire in the intimacy of your expansive oceanfront suite. ***The Pandora comes with one designated compact parking space, a fully stocked kitchen (*dishes and utensils, not groceries), a beautiful indoor fireplace off the master bedroom, a huge first floor patio PLUS a separate balcony off the guest bedroom on the second floor, an in-suite washer and dryer, BBQ and outside cooking station, outside fire pit, soaking tub in master bedroom, linens, hair dryer, bathroom towels, beach towels, beach chairs, and access to the gated, communal rooftop deck and private beach staircase. Also included in the listed price: maid & linen service every 10 days, cable/wifi, all utility services, parking, weekly yoga on our oceanfront rooftop sundeck, and 24/7 maintenance and on-site staffing. And don't forget, we are pet-friendly! We are at your service and look forward to pampering you while you relax by the beach! Call for a tour today. Have a question for Seacliff?